“Spectre,” Daniel Craig’s fourth (and possibly final) James Bond film, hits theaters Friday, and a few common themes have emerged from the reviews so far: First, that this is a highly serviceable Bond movie. Second, that it’s no “Skyfall.” And lastly, that director Sam Mendes takes great pains to ponder whether Bond — spy, womanizer, Cold Warrior — and all of his timeworn tropes are still compatible with audiences in 2015. We can sympathize with that last one. (There’s a reason many of the classic Bond movies haven’t exactly aged well.) And we’re all for big franchises taking chances in departing from familiar patterns. But with a run spanning 24 films over 53 years, Bond is the most prolific franchise in movie history. Its format has been so refined over the decades that there’s an 8,500-word Wikipedia page devoted strictly to its motifs. As much as anything, the Bond series is defined by the very tropes that today’s directors spend so much time grappling with. Instead of denying them, then, let’s celebrate the ones worth preserving. When at their most fun and engaging, the Bond films are about a debonair hero outfitted with insane tech, saving humanity from the convoluted plots of over-the-top supervillains and their hench-persons. So we set about trying to (quasi) scientifically determine which of those elements — Bond actors, MI-6 colleagues, gadgets, plotlines and enemies — from past Bond movies are the best, in the hopes of eventually cracking the code that makes the most awesome Bond possible. For the uninitiated, maximum likelihood attempts to find a rating for every item in a category that best explains the results of the voting. So if, say, the cutter/detonator wristwatch is often considered more useful than other gadgets, it will receive a strong rating to reflect the high likelihood that a subsequent voter would choose it in any given matchup. One of the cool things about maximum likelihood ratings is that they can be converted to a 0-100 (percentage) scale that reflects the probability of being selected over an average item in their category. So, below, we’ll be ranking everything, from handsome Bonds to explosive plots, using that metric. But enough about how we calculated things. Let’s get to the rankings! The guy in the tuxedo holding the martini is, unsurprisingly, an essential building block for any Bond film. And the people have spoken: Sean Connery in “Goldfinger” reigns supreme. But it’s not a runaway victory by any means — Craig in “Skyfall” is right on his heels. In fact, the results of our poll are striking — each of the top nine slots on the list belongs to Connery or Craig. 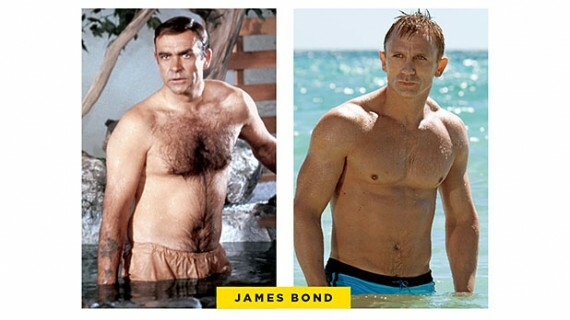 And on average, Craig’s films feature a higher “Bond sexiness” factor, although Connery is a fraction of a point behind (in twice as many films). Let’s call it a tie between the two most physically impressive Bonds. Behind them, the consensus ordering is clear: Pierce Brosnan, then Roger Moore, Timothy Dalton and everyone’s punching-bag Bond, George Lazenby. As this exhaustive list of contraptions shows, gadgetry is a pretty important part of any Bond movie. Harking back to our Cold War-era love of spies, science and hiding guns and cameras just about everywhere, 007 has to be outfitted with the latest in weird, preferably explosive technology. Our voters liked the aforementioned cutter/detonator wristwatch from “Die Another Day,” as well as the (presumably different?) wristwatch equipped with a grappling hook and high-intensity torch from “The World Is Not Enough.” And what self-respecting double-naught spy wouldn’t make good use of the attaché briefcase in “From Russia With Love” (containing a knife and sniper rifle, 50 gold sovereigns and a gas bomb to prevent tampering)? Saving the (Western) world is pretty much what MI-6 pays Bond to do, but which time required the greatest degree of spycraft, skill and resourcefulness? Our voters had two main contenders: “GoldenEye,” in which 007 thwarted a plan to steal money from the Bank of England (electronically), erase financial records and destroy Britain’s economy,1 and “Goldfinger,” when he stopped a rich gold smuggler from devaluing all the gold in Fort Knox (via radiation) to make himself comparatively richer. But they were not impressed with “The Living Daylights” — all Bond did there was avert a rogue general’s plot to deal drugs using embezzled Soviet funds. Meh. Here’s how a James Bond movie works: After an implausible escape from what should have been certain death, 007 mounts a final attack on the supervillain in his secret lair. But before defeating the Big Bad, he has to fight that scoundrel’s second-in-command. And among those evil lieutenants, our voters thought two stood out in particular: The hat-tossing Oddjob from “Goldfinger” and the hulking Jaws, who appeared in “The Spy Who Loved Me” and “Moonraker.” They’re great picks; each provided the Bond franchise with some of its most memorable fight scenes. But apparently readers didn’t think as highly of this scene from “For Your Eyes Only” — they rated its henchman, Apostis, as the worst of the Bond films, effectively throwing another piton into his chest as he tumbles off the side of a metaphorical mountain. Every great Bond film needs a great villain. Well, maybe. Crunching the numbers on every movie in the Bond franchise found that there’s only a moderate correlation2 between Rotten Tomatoes’ adjusted scores and our archvillain ratings. But for the two antagonists rated mostly highly according to our voters, Rotten Tomatoes also lists their eponymous movies among the top four Bond movies ever made. Auric Goldfinger probably deserves his No. 1 slot solely on the basis of what might be the greatest villain’s line in cinema history: “No, Mr. Bond, I expect you to die.” And the reclusive, island-owning Dr. No has served as the prototype for every evil scientist bent on revenge since 1962. The only real surprises atop the list might be that SPECTRE head Ernst Blofeld (so iconic he inspired the Dr. Evil of “Austin Powers”) doesn’t show up until No. 8 in our rankings and that Raoul Silva of “Skyfall” ranks third, making him the best Bond villain in 48 years. Meanwhile, the bottom of the list reinforces how little our voters cared for “The Living Daylights”; the aforementioned rogue Soviet general, Koskov, ranks second-to-last — presumably for devising a plot that required so little spycraft from Bond. And bringing up the very rear is General Medrano, a co-villain from “Quantum of Solace” who isn’t even killed by Bond. When faced with a choice between Medrano and an average villain, maximum likelihood tells us there’s only a 5.6 percent chance a voter would pick Medrano. As for “Spectre,” it’s early to say where its components will fall in our rankings. (Since voting closed before the film opened, we didn’t include it in any of the categories.) The early reviews on Christoph Waltz as the villain Oberhauser have been good, and it’s a good bet that Craig will look like a million bucks. But perhaps the next Bond film — whoever is in the lead role — can take a cue from our voting and learn which combination of parts make for the best of everything 007. It helps when your enemy refuses to kill you at every possible opportunity. For those interested, the exact correlation coefficient is 0.4.